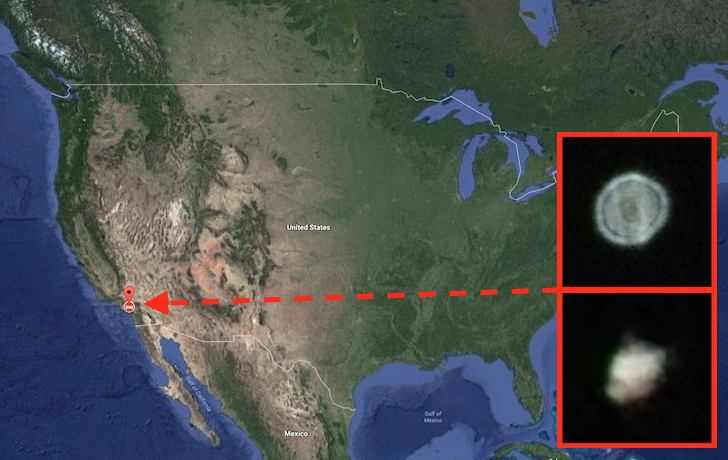 UFO Sighting Over Chino, California May Be Evidence Of Alien Base Below State Park, Dec 2017, UFO Sightings Daily. This particular style of UFO has been seen many times around the globe over the years. Sometimes its even a hexagon shape, hovers, then moves away. Chino has a huge park called Chino Hills State Park. It has over 14,000 acres, or 57 square km. Many UFO bases are hidden below mountains and volcanos, for instance the Colorado mountain range where even police officers reported round spherical glowing whit balls of light, much like todays sighting. So I do feel there is some alien presence below this park. Probably a small base about 5km below the surface. I was inside my car when I saw the object and took out my camera and it did not make any noise. It disappeared behind a tree, so I got out of the car to see it, but it was not gone or disappeared.